Some songs just stop you dead in your tracks. “Soulmate” by Natasha Bedingfield had that impact on me when I first heard it years ago. It literally took my breath away, and still does, as it hits on such a poignant and painful topic. Why are there people who are “alone” when there are so many of us in this great big world? Hopefully those quotes surrounding “alone” give you the answer as I see it – because we are never really alone. We are actually surrounded by souls who touch us and impact who we are, whether we consider them mates or not. At the time I first heard the song I was pretty sure I had found my soulmate in my husband Carl, but I was also still very resistant to the idea that just one person could be anyone’s perfect match. Besides, I was far too much of a feminist to ever believe that I needed a man to fulfill my soul. After all, one of my favorite U2 lines had always been, “a woman needs a man like a fish needs a bicycle,” so my belief in the essentials of partnering was a bit jaded. This likely came from the many years I spent single seeking “the one.” Those years of envying my high school, and later college friends who seemed to so effortlessly fall in love, clearly took their toll. By the time I had reached my early twenties I had given up the hope of ever meeting a mate. That of course was when I finally met Carl. Proof that the universe works on its own time and under its own influences, once I stopped looking, he appeared. And, oddly he wasn’t at all what I had expected, or even hoped for. That’s not to discredit him in any way, it is just yet another universal truth that what we want is not always what we need. But, luckily, the universe knows best and things always unfold as they should. Although I can concede that I am extremely blessed to have found Carl, and I now realize that a fish needing a bicycle may not be so far-fetched, this post is not meant to be about Carl and me. On the contrary, what I really want to convey here is that our lives, and even our ever growing capacity for love, is like a tapestry weaved with many individual threads. Every person who has ever touched my heart, made me laugh, made me cry, or otherwise shared in my journey, makes up a piece of my soul. I blogged a few days ago about my high school reunion, as the impact of that night left a lasting impression. Seeing old classmates and lifelong friends reminded me that no matter how much time passes our souls remain intertwined in a very magical way. 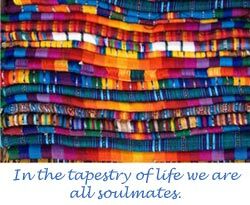 Although our individual tapestries have each grown larger, more intricate, and much more beautiful, somewhere deep within each tapestry is a single thread that weaves our lives together. So, while I do wish that every person finds a special someone to love, a best friend, a confidante, I also hope that we never lose sight of the fact that there is not only one. We are all soulmates.